Coagulase-negative staphylococci (CNS) cause usually subclinical or mild clinical bovine mastitis, which often remains persistent. Symptoms are usually mild, mostly only comprising slight changes in the appearance of milk and possibly slight swelling. However, clinical mastitis with severe signs has also been reported. The reasons for the differences in clinical expression are largely unknown. Macrophages play an important role in the innate immunity of the udder. This study examined phagocytosis and killing by mouse macrophage cells of three CNS species: Staphylococcus chromogenes (15 isolates), Staphylococcus agnetis (6 isolates) and Staphylococcus simulans (15 isolates). Staphylococcus aureus (7 isolates) was also included as a control. All the studied CNS species were phagocytosed by macrophages, but S. simulans resisted phagocytosis more effectively than the other CNS species. Only S. chromogenes was substantially killed by macrophages. Significant variations between isolates were seen in both phagocytosis and killing by macrophages and were more common in the killing assays. Significant differences between single CNS species and S. aureus were observed in both assays. This study demonstrated that differences in the phagocytosis and killing of mastitis-causing staphylococci by macrophages exist at both the species and isolate level. Mastitis is a major disease of dairy cows that is most often caused by bacteria such as staphylococci, streptococci and coliforms. Staphylococcus aureus and coagulase-negative staphylococci (CNS) are isolated in about half of mastitic milk samples in Finland  and in many other countries [2–4]. The manifestation of staphylococcal mastitis varies considerably. It is well-known that S. aureus is able to cause severe clinical signs, but generally it causes persistent subclinical mastitis. CNS generally cause subclinical or mild clinical mastitis , although clinical CNS mastitis with severe signs has also been reported [4, 6]. Self-clearance of CNS mastitis soon after parturition is commonly expected [7, 8], but CNS have been shown to frequently persist in the udder throughout lactation, causing an elevated somatic cell count (SCC) [9–11]. Phagocytic leucocytes form the primary cellular defence of the udder . During lactation, normal milk from a healthy bovine udder contains a small number of leucocytes, usually <50 000 cells/ml [9, 12]. These cells, which are first in line to meet possible intruders, are mainly macrophages . The role of these macrophages in either the prevention or induction of inflammation is crucial. Among several other functions, they recognize microorganisms, alert the immune system and initiate an inflammatory reaction (reviewed, for example, in ). Only after the initiation of inflammation are polymorphonuclear neutrophils (PMNs) enrolled, which move from the blood into the milk, raising the SCC in the milk to hundreds of thousands or millions cells/ml. S. aureus is well known for its ability to evade phagocytosis [14, 15] and persist in the udder . For example, S. aureus expresses several antiopsonic cell-surface components, including a polysaccharide capsule and surface protein A, which enable the bacteria to efficiently resist phagocytosis. This species also has several mechanisms allowing it to survive within phagocytic cells, including enzymes that neutralize free radicals . CNS are also known to persist in the udder [9–11], which implies that, like S. aureus, they have developed means to resist phagocytosis. However, the virulence factors related to the putative ability of CNS from bovine mastitis to resist phagocytosis are still poorly characterized. Our aim was to investigate the resistance to phagocytosis of the bovine-associated CNS species S. chromogenes, S. simulans and S. agnetis, and to examine possible differences in resistance to phagocytosis and killing between these staphylococcal species and isolates. S. chromogenes and S. simulans were selected for study due to their isolation frequencies, and S. agnetis to gain information on this recently described species. S. aureus was included as a control. Macrophages were used to represent the primary stage of cell-mediated innate immunity, and a commercial mouse macrophage cell line was selected to achieve stable growth characteristics. Here, we report differences between species and isolates in the phagocytosis and killing of mastitis-causing staphylococci by macrophages. The 43 Staphylococcus isolates used in this study are listed in Table 1. The isolates were selected on the basis of their clinical properties, and included isolates from clinical or subclinical mastitis as well as from persistent or transient intramammary infection. Almost all isolates originated from different dairy herds, and they were likely to be genetically different. As a reference, isolates from extramammary sites and type strains of Staphylococcus were also included in the study. Staphylococci were routinely grown in Mueller Hinton (LabM, Bury, UK) at +37°C. The strains and isolates were maintained at -80°C in Mueller Hinton broth containing 8.7% (vol/vol) glycerol. 1The isolates from clinical or subclinical mastitis, except for two S. aureus isolates from subclinical mastitis, originate from the data of . Two S. aureus isolates from subclinical mastitis originate from the data of Taponen et al. . The isolates from persistent or transient bovine mastitis originate from the study of Taponen et al. and the isolates from extramammary sites (skin of the udder, teats, perineum, and the milker’s hand) originate from the study of Taponen et al. .
*One of the S. agnetis isolates from clinical mastitis is the S. agnetis type strain DSM 23656T. The murine macrophage cell line J774, derived from BALB/cN reticulum cell sarcoma (ATCC TIB-67; American Type Culture Collection, Rockville, Md., USA), was maintained at +37°C with 5% CO2 in growth medium (GM) containing Dulbecco Modified Eagle medium (DMEM High Glucose, GlutaMAX™; Gibco, Grand Island, NY, USA) supplemented with 10% heat-inactivated foetal bovine serum (Gibco). Cells were maintained as monolayers in 75 cm2 flasks and passaged two or three times weekly by scraping and diluting the cells into fresh DMEM with 5% foetal bovine serum. The staphylococci to be used in the phagocytosis and killing assays were grown overnight in Mueller Hinton broth. The OD600nm of the cultures was determined, and the cells were collected by centrifugation, washed once with phosphate-buffered saline (PBS) and resuspended in GM to an approximate concentration of 6 × 106 colony forming units (CFU)/ml. Cells were divided into aliquots and stored at -80 C until further use. Before the infection assays, the viability of the frozen Staphylococcus cells was determined by thawing them at +37°C in a water bath for 30 min, followed by suitable dilution in buffered peptone water (LabM, Bury, UK) and plating on Mueller Hinton agar. The number of viable Staphylococcus cells was determined by counting the CFU after overnight incubation (20–23 h). The in vitro phagocytosis and killing assays were performed essentially as described previously , with some modifications. Murine J774 cells were seeded into 24-well microtiter plates (Greiner Bio-One, Frickenhausen, Germany) at a density of 1 × 105 cells per well (volume 800 μl). After 24 h, these cells were infected with 1 × 105 of Staphylococcus cells (in 50 μl volume) derived from frozen aliquots. Before addition to plates, the bacteria were thawed for 30 min in a water bath at 37°C and diluted in fresh GM. The plates were centrifuged shortly after the addition of bacteria (5 min 180 g RT). Thereafter, the plates were incubated for 1 h at +37°C with 5% CO2. After incubation, the treatment of plates differed between phagocytosis and killing assays. In the killing assay, the J774 cells were lysed by incubating them in GM with 0.1% saponin (vol/vol; Merck kGaA, Darmstadt, Germany) for 15 min at +37°C with 5% CO2. Thereafter, the lysed samples were removed from wells by vigorous pipetting, the wells were washed with PBS and the recovered buffer was combined with the lysate previously recovered from the wells. Aliquots from these samples were plated as described in the viability determination of frozen Staphylococcus cells to count the total number of surviving bacteria in the samples. In the phagocytosis assay, after infection, the extracellular bacteria were recovered by carefully removing the GM from the wells. Thereafter, the wells were washed with PBS by cautious pipetting and the recovered buffer was combined with the GM previously recovered from the wells. To count the extracellular bacteria in these samples, plating was carried out as in the killing assay. As a reference for both assays, staphylococci were incubated simultaneously in plates without J774 cells, and the wells in these plates were treated as in the phagocytosis assay. The numbers of killed staphylococci were calculated by subtracting the counts of surviving staphylococci from the counts of staphylococci in reference samples. The numbers of phagocytosed staphylococci were calculated by subtracting the counts of extracellular staphylococci from the counts of staphylococci in reference samples. The quantities of killed and phagocytosed staphylococci are presented as percentages of reference sample values. Each value represents the mean of three independent experiments, with two replicates for each sample in a single experiment. Mean values for the phagocytosis and killing of each of the studied Staphylococcus species and isolates by murine macrophage cell line J774 were calculated. All results are expressed as arithmetic means ± standard deviation. The studied isolates were grouped on the basis of variables related to the nature of infection (clinical/subclinical) in order to determine whether this isolate attribute has an effect on the phagocytosis or killing of staphylococci by murine J774 macrophages. The possible effects of staphylococcal species, staphylococcal isolate and the above-mentioned isolate attributes on the phagocytosis and killing of staphylococci by the murine macrophage cell line J774 were examined. The arithmetic means of the three repeated, independent experiments for each isolate were used in the statistical analyses in order to avoid the clustering effect. The independent-samples Kruskal-Wallis test was used to study the possible effects of these factors on phagocytosis, for which the data were not normally distributed. The data for bacterial killing were normally distributed and ANOVA was used to examine the possible effects of these factors on killing. Test results were considered statistically significant if the calculated p values were < 0.05. Staphylococci were not resistant to phagocytosis by murine J774 macrophages, since phagocytosis occurred for all the isolates of the four studied Staphylococcus species during the one-hour incubation with these cells (Figure 1). Among all the studied staphylococcal isolates, the mean percentages of phagocytosis varied from ~40% (S. simulans isolate 116) to ~ 97% (S. chromogenes isolate 316). The standard deviation of the mean phagocytosis rates varied from 1.3% (S. chromogenes isolate 316) to 32.8% (S. simulans isolate 102). The mean phagocytosis percentages (±SD) of S . chromogenes (A) , S. simulans (B), S. agnetis (C) and S. aureus (D) isolates by murine J774 macrophages. Bars indicate the average result ± standard deviation of three separate assays, with two replicates of each sample in a single experiment. The origins of the isolates included are marked with different bar colours. The mean percentage of phagocytosis for S. simulans was 68.4% ± 21.36%, whereas for the other studied species it varied between 83.3% and 91.0% (Figure 2A). For all the studied Staphylococcus species, the median percentage of phagocytosis did not significantly differ from the mean values (results not shown). S. simulans was significantly less phagocytosed than S. agnetis (p = 0.014) and S. chromogenes (p < 0.001). In contrast, no significant difference in phagocytosis was observed between S. simulans and S. aureus (p = 0.185), while S. aureus was significantly less phagocytosed than S. chromogenes (p = 0.020). No differences in phagocytosis were recorded between isolates derived from either subclinical or clinical infections (p = 0.544). The mean phagocytosis (A) and killing (B) percentages (±SD) of S . chromogenes, S. simulans , S. agnetis and S. aureus by murine J774 macrophages. S. simulans was less phagocytosed than S. agnetis (p = 0.014) and S. chromogenes (p < 0.001). S. aureus was less phagocytosed than S. chromogenes (p = 0.020). S. chromogenes differed from other species and was killed more efficiently (p < 0.05). Negative values for killing are due to the growth of staphylococci during saponin treatment. Large and statistically significant variation was recorded in the phagocytosis of different S. simulans isolates which varied from 39.9% ± 11.4% to 91.5% ± 3.6%. Such variation between isolates was not observed for the other Staphylococcus species. There was considerable variation between bacterial species in the killing of staphylococci by murine J774 macrophages during the one-hour incubation period (Figure 2B). S. chromogenes was more efficiently killed by murine J774 macrophages than any of the other Staphylococcus species studied. 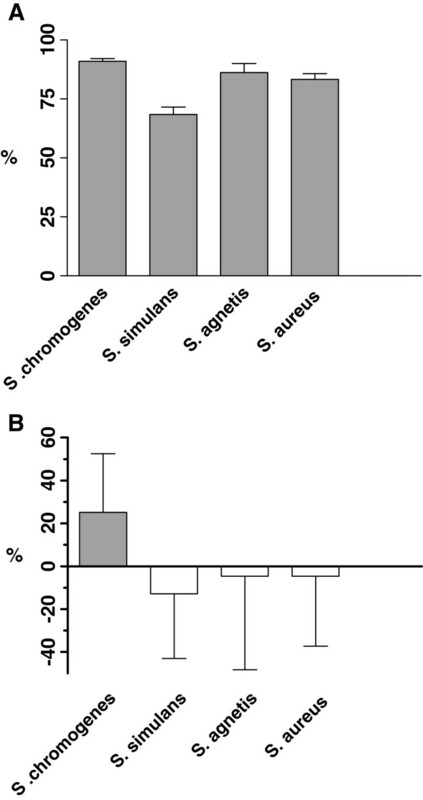 The p-values of statistical differences between S. chromogenes and S. simulans, S. agnetis or S. aureus were <0.001, 0.048 and 0.016, respectively. The mean percentage of killing for S. chromogenes was 25.10% ± 27.41%, but for the other Staphylococcus species the values were negative (Figure 2B). This was most likely due to the multiplication of bacterial cells in the GM during saponin treatment (Åvall-Jääskeläinen et al., unpublished observations). Substantial differences were detected in the killing of different isolates within a single species for all the studied CNS species. Some of the studied Staphylococcus isolates were not killed at all, whereas others were efficiently killed. The maximum mean percentage killing of a single isolate was 60.1% (S. chromogenes isolate 92) (Figure 3). No difference was recorded in the killing of isolates derived from either subclinical or clinical infections (p = 0.363). The mean killing percentages (±SD) of S. chromogenes (A) , S. simulans (B), S. agnetis (C) and S. aureus (D) isolates by murine J774 macrophages. Bars indicate the average result ± standard deviation of three separate assays, with two replicates of each sample in a single experiment. The origins of the strains included are marked with different bar colours. This study examined the ability of macrophages to phagocytose and kill bovine mastitis-associated strains of S. aureus and the CNS species S. simulans, S. chromogenes and S. agnetis. This is related to the capability of the bacteria to initiate infection, as resistance to macrophages is crucial, especially in the first stages of infection. As references, extramammary isolates and type strains of these staphylococcal species were also included. All the studied species were phagocytosed, although differences were recorded in the efficacy of phagocytosis. S. simulans resisted phagocytosis more than S. chromogenes and S. agnetis. Inside the macrophages, S. chromogenes was more efficiently killed than the other Staphylococcus species. Although the phagocytosis of bovine mastitis-associated S. aureus by PMNs [20–22] and macrophages [23, 24] has been extensively studied, the phagocytosis of CNS has earlier received little if any research attention. For this study, we selected CNS species that are not only relevant and frequent, but also differ from each other as a cause of bovine mastitis. Thus, S. chromogenes and S. simulans, species belonging to the few most frequently isolated CNS species in the Nordic countries , were chosen. S. chromogenes is suspected to belong to the bovine skin microbiota [18, 25], and is also the most commonly isolated CNS species in bovine milk, especially in heifers around calving  and in first lactation . S. simulans, also commonly isolated in mastitic milk samples, especially in Nordic countries [4, 16], has been reported to have a tendency to cause a stronger inflammatory reaction than other CNS species . S. agnetis, a recently described bovine-associated coagulase-variable species , was also included as a new species for which information is still limited. S. agnetis, described by our research group, is frequently isolated from mastitic milk samples, but does not belong to the few most commonly isolated CNS species (Taponen, unpublished results). It is closely related to and was earlier classified as S. hyicus, which has been reported to cause stronger inflammatory reactions than many other CNS species . Few studies have examined the phagocytosis of S. simulans[29–31], and the present study is, to our knowledge, the first examining the phagocytosis of S. chromogenes and S. agnetis. In this study we used murine macrophages rather than neutrophils, as in the udder they are the first phagocytes of innate immunity and thus have an important role in the early immune response . To ensure repeatability, we used a commercially available cell line rather than freshly isolated cells. To our knowledge, no commercial bovine macrophage cell lines are available. However, the murine macrophage cell line J774 has stable growth characteristics and has been used in numerous bacterial phagocytosis studies [19, 32, 33]. In terms of the innate recognition of bacteria, the differences between murine and bovine macrophages are quite small. For example, the selection of toll-like receptors (TLRs), known to be the most important pattern-recognition receptor family, is similar in macrophages of both species, as mouse macrophages possess all the known cell surface TLRs of cattle macrophages. Murine macrophages can thus be used to evaluate trends and differences in phagocytosis between the different bovine-associated bacterial isolates, keeping in mind that the values for phagocytosis obtained this way are not necessarily exactly the same as would be obtained by using bovine macrophages. When phagocytosis and killing were compared between the CNS species, some significant differences were seen. S. simulans resisted phagocytosis more effectively than the other CNS species studied, and if phagocytosed, also resisted killing by phagocytes as effectively as S. agnetis or even S. aureus. S. chromogenes, by comparison, was phagocytosed more easily than S. simulans, and also more efficiently killed by phagocytes than any other studied species. Interestingly, these two species also appear to behave differently as udder pathogens. S. simulans is commonly isolated in milk samples originating from mastitic udders [4, 16, 28, 34]. In two field studies, a tendency has been observed for S. simulans to cause slightly more clinical signs than other CNS species [16, 34], and in an experimentally induced bovine mastitis study it caused a slightly stronger inflammatory response when compared to S. epidermidis. On the other hand, S. chromogenes is known to be commonly isolated in bovine mastitis milk samples, especially from first lactation cows [11, 16, 26, 36], and to colonize the teat and udder skin of heifers before and around calving [25, 37]. Even though these species are both usually classified as opportunists, molecular data indicate that S. simulans may be specifically associated with mastitis, whereas S. chromogenes could be regarded as a species belonging to the bovine skin microbiota [18, 37]. This difference is consistent with the observation that S. chromogenes in this study was more easily phagocytosed and killed than S. simulans. However, despite their differences, both S. simulans and S. chromogenes commonly persist in the udder, even for an entire lactation, causing an elevated milk SCC [9, 11]. In experimentally induced mastitis , six of eight S. simulans mastitis infections remained persistent. This study was the first to examine the phagocytosis of S. agnetis, which is a newly described coagulase-variable staphylococcal species isolated from subclinical and mild clinical bovine mastitis . In this study it is regarded as coagulase-negative, as only few strains are coagulase-positive and production of coagulase is slow compared to that of S. aureus. Most of the known S. agnetis isolates have previously been misidentified as S. hyicus by phenotypic identification methods, as the two species are closely related. Very little is known about the infectivity and virulence of this new species. In this study, S. agnetis was significantly more phagocytosed than S. simulans. However, in the killing assay, the results for S. agnetis were similar to those for S. simulans and even S. aureus, as these bacteria were not killed by murine macrophages. S. aureus is commonly regarded to have a special status among mastitis-causing staphylococcal species in terms of the severity of inflammation, virulence, persistence and transmission. Although S. aureus mastitis can be severe and sometimes even toxic, it typically, and possibly after a clinical phase, causes chronic subclinical mastitis associated with a moderate or periodically high milk SCC. On the contrary, CNS rarely cause clinical mastitis, and the milk SCC in CNS mastitis usually varies from low to moderate, although the SCC may occasionally be high . The mechanisms underlying the differences in the clinical manifestation of S. aureus and CNS mastitis are still unknown. In this study, S. aureus did not especially differ from the other Staphylococcus species regarding their phagocytosis or killing by macrophages. On the contrary, S. simulans differed most from the other Staphylococcus species in the phagocytosis assay and S. chromogenes in the killing assay. Isolate differences in phagocytosis were seen in S. simulans and in killing for all the studied species. These results are partly the opposite to the study of Aarestrup et al. , who found significant differences between S. aureus strains in both phagocytosis and killing. However, Aarestrup et al. used neutrophils, which migrate to the udder after the macrophages have initiated an inflammatory response. In this study, none of the observed differences correlated with the nature of infection (clinical/subclinical). This may, however, be due to the small data sub-sets. Staphylococci can resist phagocytosis and killing in several ways. For example, the capsule and other extra-cellular polysaccharides are known to influence the efficacy of both phagocytosis and killing [31, 38, 39]. The Staphylococcus isolates used in this study all have a capsule/extra-cellular polysaccharide layer that can be visualized with Giemsa or Anthony’s capsule stain when grown in study conditions (Åvall-Jääskeläinen et al., unpublished observations). However, differences in these structures may exist that affect phagocytosis and/or killing. Other thus far unknown virulence factors can also have an impact on the observed resistance to phagocytosis and/or killing. Further studies are needed to examine these issues. S. simulans was significantly less phagocytosed by mouse macrophages than S. agnetis or S. chromogenes. In murine macrophages, S. chromogenes was more efficiently killed than any of the other Staphylococcus species studied. However, differences exist between isolates in their resistance to phagocytosis and killing by macrophages. Investigations at the pattern recognition level are needed to identify the mechanisms underlying these differences. We thank Juha Jääskeläinen for valuable assistance with the statistical analysis. Taina Lehto, Ulla Viitanen and Anja Osola are acknowledged for their excellent technical laboratory assistance. We also thank Tiina Salomäki for providing cell line ATCC TIB-67. This work was supported by the Mercedes Zachariassen Foundation, and was performed in the Centre of Excellence on Microbial Food Safety Research, Academy of Finland. ST, SÅJ and JK conceived and designed the experiments; SÅJ and JK conducted the laboratory experiments; SÅJ, JK and ST performed the data analysis and ST the statistical analysis; SÅJ, JK, ST and HS wrote the manuscript. All authors read and approved the final manuscript.